A new, stunning image of the cosmic spider, the Tarantula Nebula and its surroundings, finally pays tribute to this amazing, vast and intricately sculpted web of stars and gas. The newly released image, made with ESO's Wide Field Imager on the 2.2-m ESO/MPG Telescope at La Silla, covers 1 square degree on the sky and could therefore contain four times the full Moon. 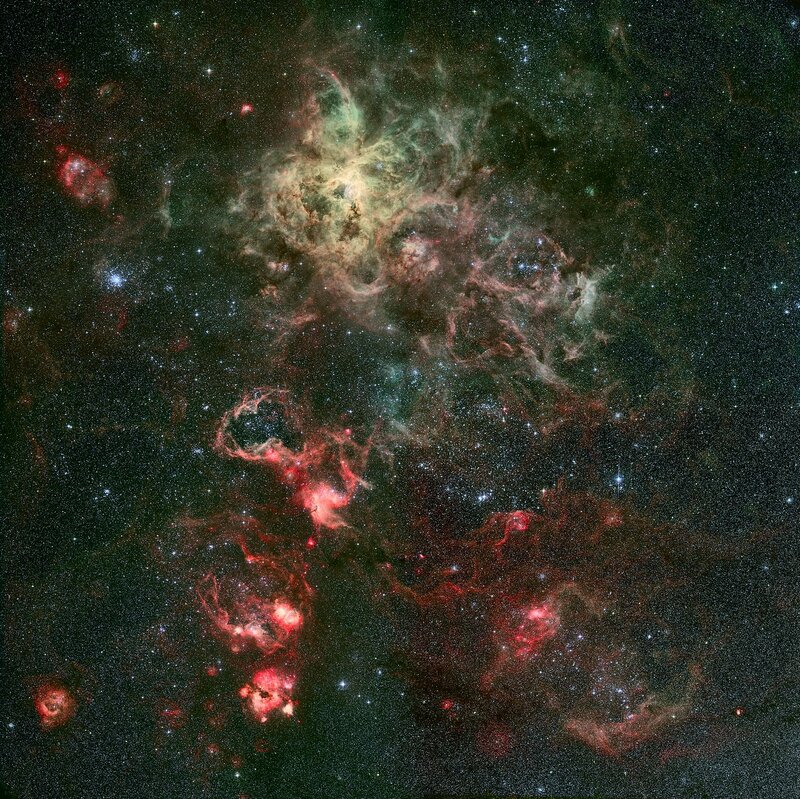 Known as the Tarantula Nebula for its spidery appearance, the 30 Doradus complex is a monstrous stellar factory. It is the largest emission nebula in the sky, and can be seen far down in the southern sky at a distance of about 170,000 light-years, in the southern constellation Dorado (The Swordfish or the Goldfish). It is part of one of the Milky Way's neighbouring galaxies, the Large Magellanic Cloud. The Tarantula Nebula is thought to contain more than half a million times the mass of the Sun in gas and this vast, blazing labyrinth hosts some of the most massive stars known. The nebula owes its name to the arrangement of its brightest patches of nebulosity, that somewhat resemble the legs of a spider. They extend from a central 'body' where a cluster of hot stars (designated 'R136') illuminates and shapes the nebula. This name, of the biggest spiders on the Earth, is also very fitting in view of the gigantic proportions of the celestial nebula - it measures nearly 1,000 light-years across and extends over more than one third of a degree: almost, but not quite, the size of the full Moon. If it were in our own Galaxy, at the distance of another stellar nursery, the Orion Nebula (1,500 light-years away), it would cover one quarter of the sky and even be visible in daylight. Because astronomers believe that most of the stars in the Universe were formed in large and hectic nurseries such as the 30 Doradus region, its study is fundamental. 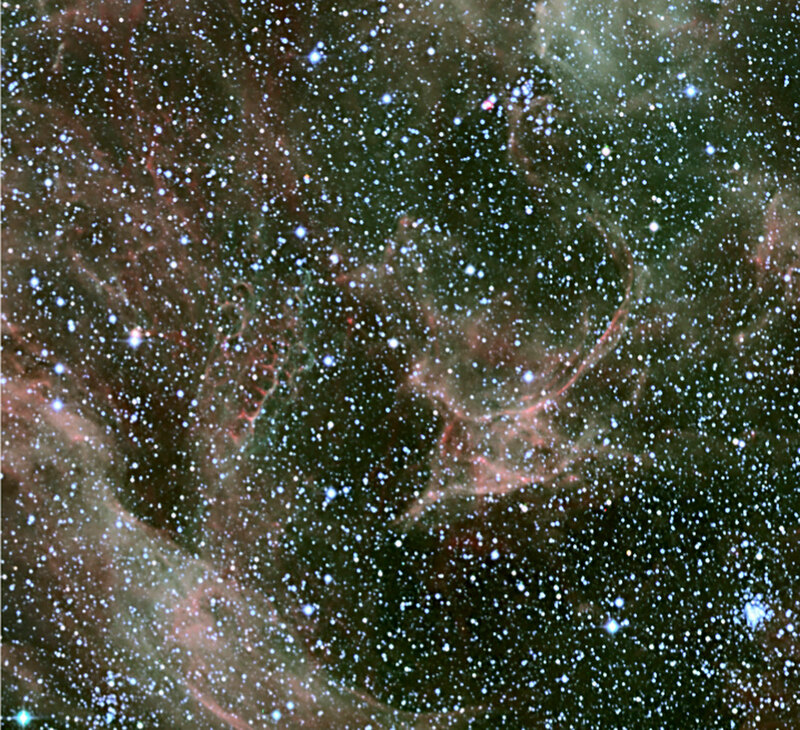 Early this year, astronomers took a new, wide look at the spider and its web of filaments, using the Wide Field Imager on the 2.2-m MPG/ESO telescope located at La Silla, Chile, while studying the dark clouds in the region. Dark clouds are enormous clouds of gas and dust, with a mass surpassing a million times that of the Sun. They are very cold, with temperatures about -260 degrees Celsius, and are difficult to study because of the heavy walls of dust behind which they hide. Their study is however essential, as it is in their freezing wombs that stars are born. Observing in four different bands, the astronomers made a mosaic of the half-degree field of view of the instrument to obtain an image covering one square degree. With each individual image containing 64 million pixels, the resultant mosaic thus contained 4 times as many, or 256 million pixels! The observations were made in very good image quality, the 'seeing' being typically below 1 arcsecond. The image is based on data collected through four filters, including two narrow-band filters that trace hydrogen (red) and oxygen (green). The predominance of green in the Tarantula is a result of the younger, hotter stars in this region of the complex. It would be easy to get lost in the meanderings of the filamentary structures or get stuck in the web of the giant arachnid, as is easily experienced with the zoom-in feature provided on the associated photo page, and it is therefore difficult to mention all the unique objects to be discovered. Deserving closer attention perhaps is the area at the right-hand border of the Tarantula. It contains the remains of a star that exploded and was seen with the unaided eye in February 1987, i.e. almost 20 years ago. 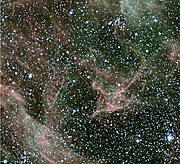 Supernova SN 1987A, as it is known, is the brightest supernova since the one observed by the German astronomer Kepler in 1604. The supernova is known to be surrounded by a ring, which can be distinguished in the image. A little to the left of SN 1987A, another distinctive feature is apparent: the Honeycomb Nebula. This characteristic bubble-like structure results apparently from the interaction of a supernova explosion with an existing giant shell, which was itself generated by the combined action of strong winds from young, massive stars and supernova explosions. The image is based on observations carried out by João Alves (Calar Alto, Spain), Benoit Vandame and Yuri Bialetski (ESO) with the Wide Field Imager (WFI) at the 2.2-m telescope on La Silla. The colour composite was made by Bob Fosbury (ST-EcF). The reduced data used to make this image are released as Advanced Data Products (ADP) by the Virtual Observatory Systems Department of ESO. More detail on how to access the data are available from the 30 Doradus ADP page.